Stan James have been a name in UK bookmaking since opening their first shop during 1933. In the intervening years they have grown considerably, with over 90 branches around the country. To keep up with the trend toward online betting, they’ve also cultivated a website and app for their modern client base. Both platforms are professionally run and there are a variety of incentives to keep players active. Stan James are a big supporter of sport through a range of sponsorship deals, and one of the most trusted bookies in the country. Stan James offer great quality odds, regularly competing with many of the industry’s biggest names. You can choose to have them displayed in the decimal format, as fractions, or American style. The best value is generally found in their horseracing section, and they run surprisingly low betting margins. For football markets it’s around 4%, while other large markets tend to average out around 5%. This means great value for the punters, and so does the £200,000 daily maximum win on football bets. As you’d expect from a seasoned bookmaker, there are many sports betting markets to explore at Stan James. Coverage is particularly impressive in football and horseracing, with the bookie working hard to deliver various products that enhance the experience of betting on both. From the homepage, you can click on one football game to view an array of bets for that fixture – on average there are over 100 markets for each match. However, most of us enjoy a bit of variety, and that is available from their specials and novelty menus. You can bet on the outcome of seasonal TV shows like the X-Factor, choose who you think will be next year’s Sports Personality, or speculate on upcoming political events. Stan James have a paired down website which is one of the easiest to work with. There’s a level of streamlining that’s rare from bookmakers, with just what’s needed to produce a solid betting environment. From the homepage, you have immediate access to their live betting platform and sports section, you can also tune in to live commentary on a number of events. In the horseracing area, there are links to live streaming, along with tips and form information. Choose a bet straight away on one of the selections listed, or click on an entry to see an entire list of options and the applicable odds. They have even created a forum, which is a clever way of boosting community spirit, and you can pop over there to give or receive tips on sports betting. 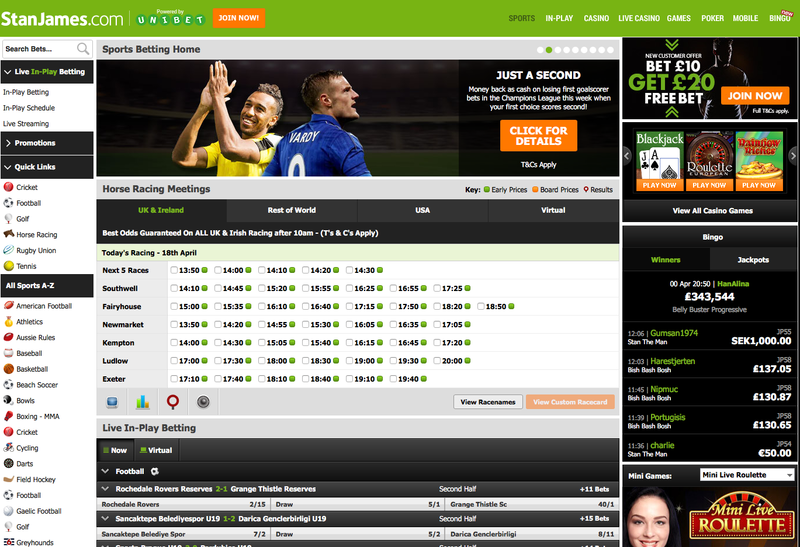 Another quirky feature is the Tipping Game page, which brings together the selections that have garnered the most tips. You can browse through these and add some of your own, but it’s always best to compare what odds are on offer elsewhere before acting on a tip. Stan James have created a mobile app for iOS and Android gadget owners, which can be used to put stakes on their entire range of markets. After downloading it from Google Play, or at the App Store, you be given access to a results service, a rundown of the latest scores, stats tools, and commentaries on certain events. If you enjoy the in-play markets, you won’t be disappointed at the app, which has an excellent in-play console. Within the app, the coverage features all the sports you’d expect, including cricket, horseracing, tennis, football and golf. They also have a banking facility built in, so you can choose from the various withdrawal and deposit methods to make a transaction. The lowest deposit they accept is £5. For people who don’t speak English as a first language, you can browse the app in French, German, Danish or Spanish, and there are 19 available currencies. Although Stan James have created an in-play section, there is plenty of room for improvement here. When an event is taking place, you cannot get the score, or any graphics (assuming there is no streaming), it’s just the odds which are shown. The trouble is that without any indication of how the match or game is progressing and without live updates, many punters are going to feel like they’re flying blind. This is a huge contrast to the majority of in-play providers, that enrich the experience with plenty of information on the event as it unfolds, if they don’t have a live stream. To visit their live betting area, select the In-Play Diary button and you’ll be shown current and future events, then simply navigate to the ones which interest you. Stan James offer a live streaming service that’s limited to horse racing at the moment. Any race that is part of the Racing UK or At the Races feature is covered, but you’ll need to bet at least £1 to watch. Stan James strive to attract new customers all the time, but they also work hard to keep their loyal members rewarded with a range of offers and bonuses. At any one time, there are usually around six to choose from in their sports betting section. When you register with Stan James you’ll be given access to a £20 free bet – no promotional code is required. 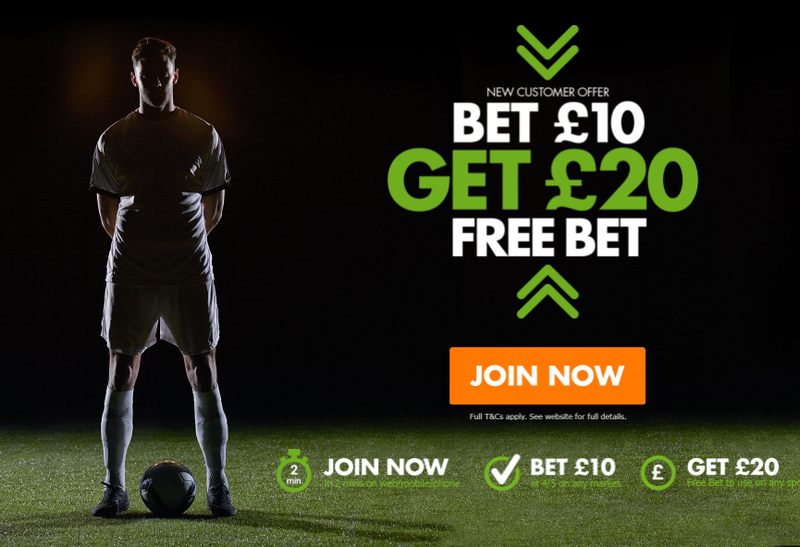 Once your account is set up, all you need to do is place a bet of £10 on any market, in any sport, and they will automatically credit your balance with another £20 free bet. You can afford to take an early price on your selection with the best odds guarantee on UK and Irish horseracing, because if the starting price ends up bigger, and you win, they will pay out at those larger odds. So, if an early price is 5/1 and you take it, then your selection comes in at 7/1, your pay-out will be at 7/1. You need to opt in prior to placing any bets and this guarantee is only available to UK and Irish races, on bets placed after 10am BST. Daily bet bonuses are paid out every day on two result wagers and multi-bets. Some offer a higher percentage of winnings and others pay out in case of your horse being disqualified from the race. Existing customers are often treated to free bets and deposit bonuses which they are notified of via email. If you are one of the lucky invite only members to be sent an offer, you’ll need to use the free bets or make a deposit within 7 days. 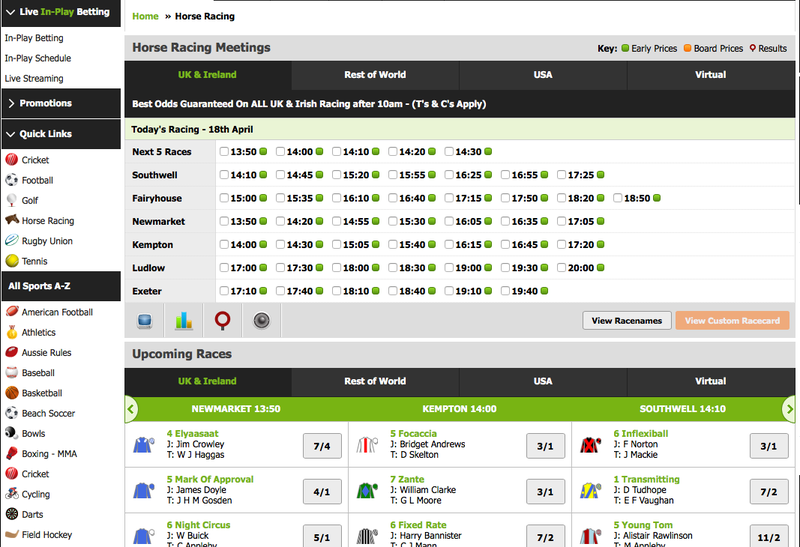 Depending on the meetings taking place, 10Bet organise a range of horse racing offers each day. Starting from 10am, they promise to bring you unbeatable prices for at least one horse, or one race, each day. Stan James are very active on social media, with Facebook, YouTube and Twitter pages where they chat with fans, share tips and run fun sports polls. If you want to hear about enhancements to the site and membership bonuses, it’s worth checking in with these accounts regularly as news gets posted there first. Also, Stan James are known for selecting certain clients and then contacting them through email to deliver exclusive bonus codes. That means you need to add their email address to your safe senders list, to avoid all their great offers end up in your junk folder. When you want to top up your account, just log in and click Deposit Funds. Stan James allow their customers to use all the recognised methods of payment when making a deposit and do not have any fees. They accept credit cards, bank transfers or e-wallet services like Skrill or PayPal. The minimum deposit is £5. They are extremely hot on identity checks, so you will need to submit various forms of identification, before they will validate your account. You may be asked for a scanned copy of your passport, ID card or bank card, along with proof of your address. It may seem long winded, but this illustrates how seriously they take their clients security. The minimum deposit is £10. Once you are a fully signed up member, you can withdraw your balance by visiting your account page and clicking Withdraw Funds. You are asked to withdraw your winnings back to the original method of payment wherever possible – this is another security feature and is implemented to help curtail international money laundering. If you cannot use the same method, you will be asked to go through their ID and address checks once again. Credit and debit cards, along with e-wallet withdrawals are the fastest way of getting your funds – they will hit your account within 1-3 days. Bank transfers will take slightly longer. No charges are made by Stan James and the minimum amount you can withdraw is £10. It’s rare to find a complaint about the standard of customer service at Stan James, the team are on hand to help clients 24 hours a day, seven days a week, and they are always courteous. You can contact them at any point on 08000 35 11 35 from within the UK, or +800 1124 1124 from outside the UK. They have three email addresses, the right one to go for depends on your situation; [email protected] is for general queries, [email protected] deals with technical support and at [email protected], there are people who can help with your betting account. Alternatively, if you prefer to put things in writing, their postal address is: Stan James, The Square, Marina Bay, Gibraltar. Stan James are based in Gibraltar, they hold a gambling license from the Government of Gibraltar and also from the UK Gambling Commission. This is enough to convince most punters that their service is trustworthy and safe. Regulation means they are obliged to maintain open and transparent gaming activities. Furthermore, they are part of the Independent Betting Adjudication Service, so if you are a member and you feel Stan James have not been able to resolve a particular issue, you can call the IBAS. Stan James are members of the Kindred Group, one of Europe’s largest online gaming providers, with more than 14 million users throughout the world. They have 17 years of experience in online safety and carefully manage their client’s private information. A dedication team deals with digital security, monitoring the platform for threats and countering any suspicious activity before it gets a foothold. A well-known bookie with years of experience on the high street, Stan James have made the transition to online betting very well. The site looks professional, it is great to navigate through and there are a wealth of sports, with enough markets on every event. However, many punters will feel that some areas need looking at again, specifically the lack of in-play information and the low welcome bonus. Issues like this place them behind other big name bookies, but even so, they are a reliable option and offer a secure base from which to enjoy sports betting.